“Penn State beats Ohio State” is a storyline that will go down smooth for many readers, even if it’s on the soccer pitch this week. The Nittany Lions beat the Buckeye’s 3-1 in their Big10 Conference opener. A big part of their success was an absolutely beautiful goal by junior Aaron Molloy. Born in Ireland, and playing in the Bohemian FC and Irish National Team youth systems before moving to the States, Molloy also earned an assist in the game by setting up junior Stephen Kenny with a free kick in the 81st minute. 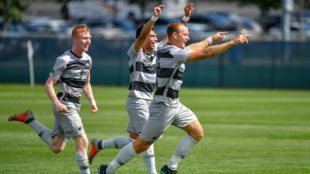 Molloy is currently a junior at Penn State, and played with Reading United this season and last, where he earned recognition as the 2017 PDL Young Player of the Year.